The Kona County Farm Bureau is a non-profit organization representing the agricultural community of North and South Kona districts. Its membership is dedicated to improving the quality of life on farms, ranches and their rural communities. The Kona chapter is a member of the Hawaii Farm Bureau Federation, which represents agricultural interests statewide. The Hawaii Farm Bureau is also a member of the American Farm Bureau Federation, representing 5.6 million farmers and ranchers at the national and international levels. As a not-for-profit organization, the Kona County Farm Bureau began the Keauhou Farmers Market in order to provide our farmers with an outlet from which to directly market their products. From the larger perspective, a true "Farmers Market" serves as a powerful educational tool expanding community awareness and building upon the general public's preference for agricultural products grown and freshly harvested on the Island of Hawai'i. 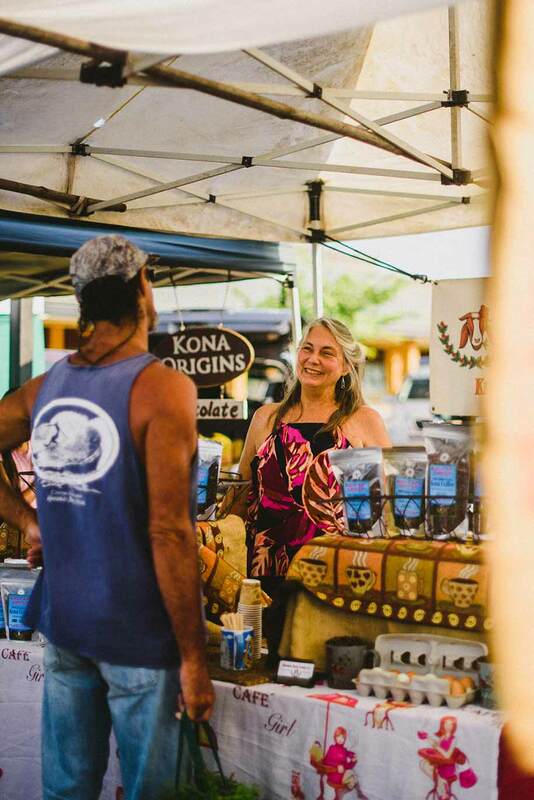 The Keauhou Farmers Market is in its ninth year of operation, it continues to prosper within what is a transformative moment in the history of food that is grabbing hold all across the country, reflected by both today's consumers as well as farmers. All farmers, ranchers, aquaculturalists and others interested in, or supportive of, the agriculture industry are invited to join the Kona County Farm Bureau. See the Benefits page for a complete list of benefits. Print and complete this form then mail it to the address provided along with a check for the membership or send it to the fax number. For more information or questions, please contact us. Memberships renew at the end of August and if you get your membership during the year, the price goes down quarterly. Those who are directly engaged in the agricultural industry. They may be independent farm producers or be serving as employees of agricultural businesses, corporations, cooperatives or associations. Regular members’ rights and privileges include the ability to hold office in the organization and vote. They also are entitled to an extensive benefits package and receive notices about upcoming meetings and special services. Those who are interested in the aims and purposes of the Farm Bureau. Associate members are entitled to an extensive benefits package; however, they do not have the power to vote or hold office in the organization. Those associations, companies or organizations which support the purpose of the Farm Bureau. Affiliate members do not have the power to vote or hold office, nor are their employees or members eligible for full privileges of a regular, associate or student member. Those who are enrolled full time in a college undergraduate program. Student benefits are the same as associate members. Student members are those who are enrolled full time in a college undergraduate program. Student benefits are the same as associate members.